Be the first to share your favorite memory, photo or story of Steve . This memorial page is dedicated for family, friends and future generations to celebrate the life of their loved one. 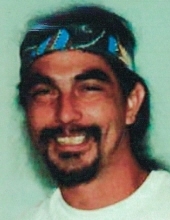 Mr. Steve Jayson Myers of California, son of James E. "Jim" Myers of Greensburg, and the late Betty Stewart Myers, was born on Sunday, April 8, 1962 in Vallejo, California, and departed this life on December 29, 2018 in Smith River, California. He was 56 years, 8 months, and 20 days of age. He was a member of the Construction Electrician's Union and worked on numerous large installation sites such as shopping malls, prisons and the Boeing Aircraft Facility in Washington State. He was also a veteran having served in the United States Navy. Besides his father he is survived by his step mother: Lois D. Myers of Greensburg; a brother: John W. Myers; a half-brother and a half-sister: James J. Myers of Nevada, and Ann Keller of California; and a host of other relatives and friends. Mr. Myers was also preceded in death by a sister: Betty Ann Myers. A Memorial Graveside Service for Mr. Steve Jayson Myers will be conducted at 1:00 P.M., Central Time, Monday, April 8, 2019 at the Greasy Creek Cemetery in Greensburg. Bro. Roger Robertson officiating. Memorials are suggested to Gideon Bibles, which can be made at the funeral home. To plant a tree in memory of Steve Jayson Myers, please visit our Tribute Store. "Email Address" would like to share the life celebration of Steve Jayson Myers. Click on the "link" to go to share a favorite memory or leave a condolence message for the family.